About a year ago I joined two Facebook groups that were formed for the purpose of buying, selling and trading sporting goods locally. One group focuses on a closer geographic area to me while the other has a wider geographic reach. At first the pages mainly listed guns then gradually as more people joined the groups I started seeing other items like tree stands, boats, ATVs, trucks, golf clubs and even dogs. I have purchased two guns from individuals listing on these sites and both times were a lot of fun. I was a little hesitant at first about buying a gun from a complete stranger, but you can tell a lot about a person when you are haggling with them. I have made several observations about the sites that I want to share with you. First, these swapping pages on Facebook are a great way to bring sportsmen together. The only other time you might get even part of this group together is at a gun show. Second, listing on these pages is more advantageous than classifies ads due to the ability to post multiple pictures which allows potential buyers to get a good look at the seller's items. Third, these pages are a seller's market. Items are usually listed at or above fair market value. Based on what I see, the majority of the people selling don’t come off their posted prices, but there is a lot of haggling via personal messages between buyers and sellers that you can’t see so there is no way to tell how much people are negotiating or coming down off listed prices. Note: trolls that are abrasive or verbally abusive are usually quickly blocked by the page admins so members don't have to deal with them. Here is the definition of an internet troll according to UrbanDictionary if you don't know what a troll is. Fourth, these sites provide a free service by allowing their members to list items to sell or trade. At no cost, it is also cheaper than exhibiting or attending a gun show. 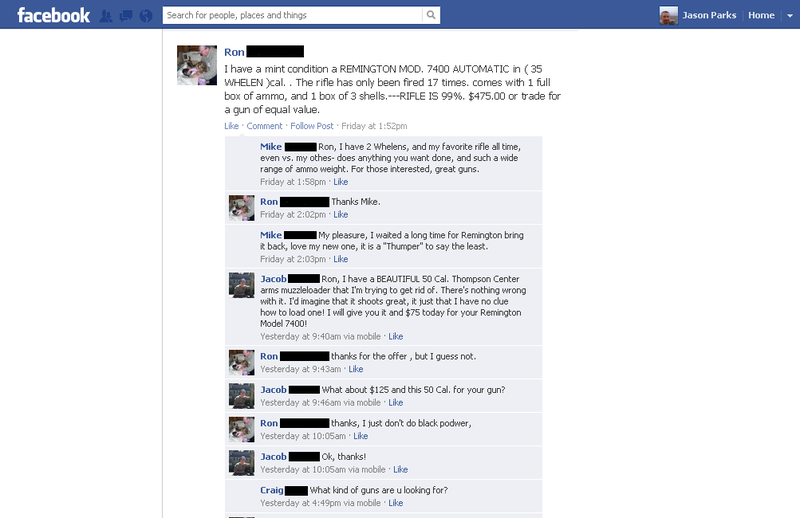 Last, since these pages have started I have noticed a sharp decline in gun related classified ads. I think we will see a complete migration away from classified ads on guns in the future and any other items listed in classifieds as soon as someone creates the page for it. I can even see the potential of how pages like these could replace local gun shows if done correctly. ...as long as "they" will allow the sites to operate. What do you think about this sudden growth of these pages?